Food Labelling / Day Dots There are 24 products. 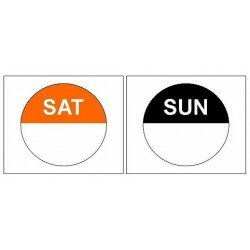 This listing is for 1 roll each of Saturday and Sunday 25mm date labels with a Peelable Adhesive. There are 1000 labels per roll. These labels are to help ensure compliance in food preparation and are a basic requirement to ensure Health and Safety in the catering / food business. They have a peelable adhesive so can be easily removed when required. 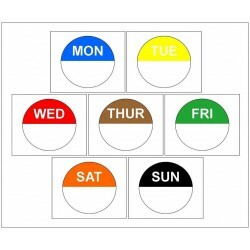 This listing is for 1 roll of Monday 25mm date labels with a Peelable Adhesive. There are 1000 labels per roll. These labels are to help ensure compliance in food preparation and are a basic requirement to ensure Health and Safety in the catering / food business. They have a peelable adhesive so can be easily removed when required. 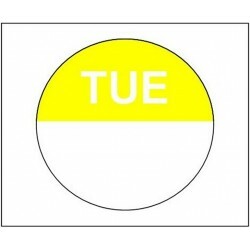 This listing is for 1 roll of Tuesday 25mm date labels with a Peelable Adhesive. There are 1000 labels per roll. These labels are to help ensure compliance in food preparation and are a basic requirement to ensure Health and Safety in the catering / food business. They have a peelable adhesive so can be easily removed when required. 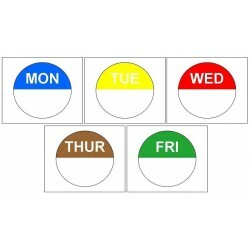 This listing is for 1 roll of Wednesday 25mm date labels with a Peelable Adhesive. There are 1000 labels per roll. These labels are to help ensure compliance in food preparation and are a basic requirement to ensure Health and Safety in the catering / food business. They have a peelable adhesive so can be easily removed when required. 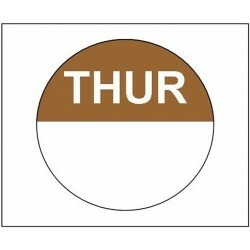 This listing is for 1 roll of Thursday 25mm date labels with a Peelable Adhesive. There are 1000 labels per roll. These labels are to help ensure compliance in food preparation and are a basic requirement to ensure Health and Safety in the catering / food business. They have a peelable adhesive so can be easily removed when required. 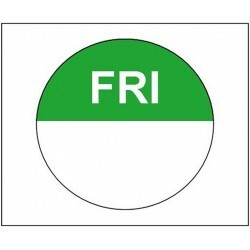 This listing is for 1 roll of Friday 25mm date labels with a Peelable Adhesive. There are 1000 labels per roll. These labels are to help ensure compliance in food preparation and are a basic requirement to ensure Health and Safety in the catering / food business. They have a peelable adhesive so can be easily removed when required. This listing is for 1 roll each of Saturday and Sunday 25mm date labels with a Permanent Adhesive. There are 1000 labels per roll. These labels are to help ensure compliance in food preparation and are a basic requirement to ensure Health and Safety in the catering / food business. They have a peelable adhesive so can be easily removed when required. 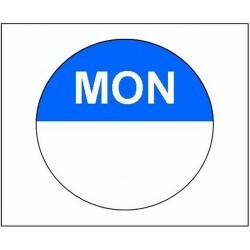 This listing is for 1 roll of Monday 25mm date labels with a Permanent Adhesive. There are 1000 labels per roll. These labels are to help ensure compliance in food preparation and are a basic requirement to ensure Health and Safety in the catering / food business. They have a peelable adhesive so can be easily removed when required.